When it comes to conservation, it’s tempting to think that science is the only guide to good policy. But biodiversity is linked to culture, argues a new study on pollinator conservation recently published in Nature Sustainability, so we should embrace a diversity of knowledge systems, acknowledging both academic science and traditional cultural practices. “Indigenous peoples’ and local communities’ knowledge is really grounded in evidence collected over centuries,” says Rosemary Hill, lead author on the study and a principal research scientist with CSIRO, Australia’s national science research agency. The paper — which builds on the Intergovernmental Science-Policy Platform on Biodiversity and Ecosystem Services (IPBES) — explores how indigenous and local communities around the world approach the conservation of pollinators like bees, birds and bats. Academic researchers reviewed academic and community writings about traditional knowledge pertaining to pollinators, while participating indigenous and local people held dialogues in their communities to decide which parts of their cultural practices to share. Require informed consent from indigenous people and local communities for conservation and development initiatives. As an example, the researchers point to India’s Forest Rights Act, which they say has ensured forest access for indigenous honey hunters, thus helping to sustain indigenous communities’ knowledge about bee conservation. Support customary land management practices. Allowing indigenous people to manage land according to their own practices can strengthen traditional practices that help conservation. Bolster indigenous and community conserved areas (ICCAs). These ecosystems are voluntarily conserved by indigenous peoples and local communities with a focus on traditional practices and customs. Bring together different forms of knowledge. 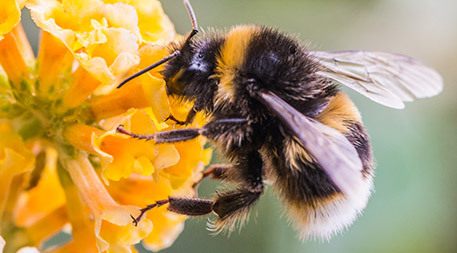 Efforts to monitor pollinator populations, for example, should consider local indigenous metrics as well as the ways science tracks trends, since people relate to their environment in different ways. Promote listing of heritage sites. International organizations such as the United Nations Educational, Scientific and Cultural Organization (UNESCO) document cultural and natural heritage around the world, and the awareness that heritage listing brings to landmarks, areas and cultural practices can aid conservation. The UNESCO Intangible Cultural Heritage List, for instance, lists the traditional knowledge of the Totonac people, an indigenous group in Mexico. Totonac agroforestry protects pollinator habitat and stingless beekeeping. Foster environmentally friendly beekeeping. With support from governments, traditional beekeeping practices can sustain people’s livelihoods. Champion food sovereignty. Food sovereignty pushes back on industrial agriculture in favor of local farming and agroecological approaches. The researchers say this helps keep landscapes varied and limits use of agrochemicals. Pasang Dolma Sherpa, executive director of the Center for Indigenous Peoples’ Research and Development (CIPRED), praises the proposals. However, she also argues that policy alone is not enough. She says it’s crucial that indigenous people continue to cultivate pride in their traditional practices, particularly among younger generations, and direct skepticism toward industrialized agriculture involving chemical fertilizers, hybrid seeds and new technologies. Both Sherpa and the paper pointed to the importance of native languages in sustaining traditional conservation knowledge and strategies. Governments have suppressed indigenous languages in Nepal, the United States and elsewhere across the globe. In 2015, the United Nations’ 193 member states established an agenda for the future: 17 Sustainable Development Goals (SDGs) to meet by 2030. The goals encompass economic, social and environmental dimensions of development. To evaluate environmental targets, the United Nations in 2018 identified 93 indicators: statistics such as the material footprint of nations, the national recycling rate and the extent of government subsidies for fossil fuels. With 2030 just over a decade away, how are we doing? In large part, we don’t exactly know. That’s a big finding from Measuring Progress, a recent review released alongside Global Environment Outlook 6 (GEO6), a report from the UN Environment Programme. For 68 percent of the environmental indicators, the report concludes that there is “too little data to formally assess” progress. Right now, the world is not on track to meet environmental targets. We can still achieve the SDGs, but to do so we’ve got to ramp up efforts to cut down on pollution, use resources efficiently, and better protect the environment. 2. Improve environmental monitoring and analysis. By boosting support for open source software, open data management, open algorithms, and other technologies, governments and businesses could help cut costs while increasing data coverage. Without an established process for collecting data and producing statistics, the report argues, it’s difficult to build awareness of environmental issues, evaluate the effectiveness of environmental interventions, and hold institutions accountable for their action — or lack of action — on the SDGs. 4. Improve national statistical systems. Countries need to invest more in their capacities to collect (and use) geospatial and environmental data. 5. Make data more accessible. Data often aren’t shared between government agencies. This hinders analysis of the relationship between people and their environment and makes it hard for scientists and other experts to access environmental information relevant to their work. 6. Focus on local and regional contexts. Countries are at different stages in the process of reaching SDGs. And many of the goals demand specific attention to the needs of individual communities, such as support for local water management plans, local breeds for agriculture, and disaster risk reduction by local governments. 7. Get serious about sustainable consumption and production. This is the 12th SDG, and it’s an important part of achieving other goals. But UN member states don’t direct enough funding toward it, and it’s the goal most lacking in data. 8. Overcome water resource challenges. Without quality, available freshwater, sustainable development is impossible — food security, poverty reduction and public health, for example, all suffer. Drought, extreme temperatures, salt in the soil: Because of conditions like these — which scientists call abiotic stresses — the fields that feed the planet yield just half the amount of food crops they have the potential to provide. With climate change, some of these stresses are worsening, even as rising population means more mouths to feed. One solution to this challenge? Naturally stress-resistant plants, or NSRPs, which thrive despite difficult environments and challenging conditions. That’s the argument from a paper by a team of Chinese researchers in the academic journal Nature Plants. People already eat some NSRPs, and the paper contends that genetic modification of these crops could give them the boost they need to be produced more widely. The researchers point to millets as one example. These edible grasses are a staple crop in parts of Africa and Asia, and they’re adapted well to one of the most formidable abiotic stresses: drought. Plus, millets can usually withstand high soil salinity and grow without much nitrogen fertilizer. An issue with millets, though, is that they often have low yields, the paper says, although scientists are working to change that. Another NSRP suited for human consumption is quinoa, which tolerates high levels of salt in the soil and can grow in a variety of climates. Higher yields would allow these and other NSRPs — such as amaranth, kaniwa and buckwheat — to be cultivated more broadly, the researchers argue. They say that advances in gene editing technology, such as CRISPR, can and should be used in conjunction with other techniques to keep the plants’ stress resistance and nutritional value in place while raising yields. The paper doesn’t address potential limitations to the argument. The authors begin their plea for a turn toward NSRPs by quoting the often cited number that “food production must increase by at least 70%” by 2050, focusing on scientific and technological solutions. They don’t address political dynamics, the reality that government policies influence the distribution of existing food resources and the composition of people’s diets. And commercialization of plants like quinoa holds the potential to funnel farmers’ resources toward a select few varieties of a given crop, at the expense of the very diversity that helps such crops withstand environmental change. Plus, some people still have concerns over genetic modification and CRISPR. More than two dozen futurists, environmental scientists and others from around the world recently put their heads together to do a “horizon scan” of emerging trends that are getting relatively little attention but have the potential to have substantial impact on biodiversity conservation in the future. The research team, led by William Sutherland, professor of conservation biology at Cambridge University in the United Kingdom, then narrowed the list down to 15 top trends poised to affect biodiversity for better or for worse in the months ahead. “By increasing recognition of the issues described in this paper, we aim to encourage dialogue about their potential negative and positive impacts on conservation, in order to guide proactive solutions and harness future opportunities,” the researchers write. Antarctic ice is melting faster than we thought. As meltwater flows to the ocean, it’s likely to change the salinity of near-shore waters and carry sediments that settle on and kill creatures living at the bottom of the sea. It also may stimulate plankton growth, changing how ecosystems function in the area. These alterations all stand to alter the flow of carbon dioxide into and out of the atmosphere, potentially affecting the trajectory of climate change. Some changes are likely to remove CO2 from the atmosphere, while others could increase its release. How these changes will affect the carbon cycle is currently unknown. Recent research suggests that permafrost holds more than 1.6 million metric tons (1.8 million tons) of mercury, far more than previously estimated and about twice the amount found everywhere else on Earth. As climate warms and permafrost thaws, much of this mercury will be released into the water cycle and transported to distant locations. Because mercury is toxic to humans and other animals, harms brain and reproductive function, and alters the function of plants and microbes, this release could have consequences for life around the world. Heightened awareness of plastic’s downsides has led to numerous efforts to produce more benign substitutes and/or ways of managing conventional plastics. Little has been done to consider the full life-cycle implications and potential unintended consequences of deploying these new approaches. But from changes in recycling approaches, to the use of biological agents to degrade materials, to the manufacture of substitutes for conventional plastics from plants, all alternatives will have ramifications of their own for food security, water use, ecosystem integrity and more. Not only that, but the promise they offer — whether it’s realized or not — could defuse other efforts to reduce rather than shift plastic consumption. Concerns that active ingredients in conventional sunscreens contributing to coral reef bleaching have led to a search for substitutes that can block ultraviolet rays from reaching beachgoers’ skin with less adverse environmental impact. One such compound, shinorine, is drawing increasing interest, with recent research yielding a method for production in commercial quantities. Shinorine is known to cause inflammation in humans but little else is known of its biological activity. Widespread adoption of shinorine without sufficient research could expose corals or other aquatic and marine organisms to a new substance with unknown impacts. A massive new irrigation canal called the Hongqi River has been proposed for northern China. Although the project is still in the conceptual stage, it is drawing attention of scientists and policy-makers alert its potential impact on ecosystems in the vicinity and far beyond. Carrying 60 billion cubic meters (2 trillion cubic feet) of water per year, the channel would have tremendous implications for the environment and biodiversity along its route, from accelerating conversion of land to agriculture to changing hydrology across the region and affecting water supplies downstream in India, Bangladesh and beyond. It also holds the potential to affect climate and even increase the frequency of earthquakes. China is developing plans to set up a battery of rocket-based devices along the edges of the Tibetan Plateau to release silver-iodide particles that will create clouds and produce rain over some 1.6 million square kilometers (600,000 square miles) of land with the goal of improving water security for people downstream. The technology, if deployed, could dramatically alter weather in the area, potentially leading to the deterioration of alpine cold steppe and meadow ecosystems and loss of habitat for species that inhabit them. It also could affect flow in river systems throughout much of Asia with ancillary impacts on both humans and ecosystems along the way. The development of salt-tolerant strains of rice is good news for food security, since it allows continued production of this important staple crop in areas where rising sea level and irrigation have increased the salinity of traditional rice-growing regions. However, because the development also holds promise for being able to expand the crop along ocean coastlines and on inland salt steppes, it raises new concerns for the integrity of ecosystems. In addition, commercial growth of salt-tolerant strains could increase demands on freshwater resources, since they may be needed to dilute saltwater to appropriate salt concentrations. Now that the U.S. Department of Agriculture has elected not to regulate the use of gene editing in plants in many instances, techniques such as CRISPR are drawing increased attention from the research and development world. The implications of increased innovation for conservation are uncertain. Gene editing applications that reduces the use of farm chemicals or makes it possible to produce more crops on less land could bode well for biodiversity. Those that bring unintended consequences to wild species or that result in increased use of agro-chemicals could lead to adverse outcomes instead. The (perhaps) good news: Genetic engineers have figured out a way to get other oilseed crops to produce the omega-3 fatty acids that are normally found in fish and prized for their health-promoting capabilities. Application of this technology might not only improve the nutritional value of vegetable oil, but also reduce harvest pressure on strained wild fish populations. The (perhaps) bad news? By displacing other oils within the oilseed plants, these alterations could diminish the plants’ ability to provide sustenance to insects. In fact, one study has already shown that caterpillars that feed on the genetically altered plants are more likely to develop into butterflies with deformed wings than are other caterpillars. Growing demand for sustainable agricultural may usher in a new agricultural revolution based on modifying plant microbiomes — complex communities of microbes that affect growth, disease resistance, drought tolerance and more. Because of their complexity, microbiomes have not been extensively manipulated in the past, but recent technological advances may change that. Increasingly cheap DNA sequencing and developments such as machine learning have led to an explosion in start-up companies aimed at modifying plant microbiomes to benefit agriculture. Other applications could include improving our ability to restore damaged ecosystems. The implications of manipulating plant microbiomes are unknown, but may be both positive and negative for biodiversity, ranging from reduced pesticide and fertilizer use to the expansion of farmland into areas currently unsuitable for agriculture. Only 2 percent of land in the Indo-Malay islands are formally protected from development, despite the region’s rich biodiversity and exceptional number of organisms found nowhere else. Oil palm plantations on the islands are small relative to more-established plantations in nearby island nations, but deforestation is increasing and there are indications the palm-oil industry is expanding. Because so many species are unique to the Indo-Malay islands, further expansion of plantations could lead to a large number of extinctions. The slice of the ocean that stretches from 200 to 1,000 meters (656 to 3,280 feet) below the surface teems with fish, but economics and technology have limited human exploitation for food — until now. As demand for ocean fish grows, a number of countries, including Pakistan and Norway, have begun to explore harvesting this “mesopelagic zone.” Fish in this zone perform important functions in ocean food webs and carbon capture; they also tend to reproduce and grow slowly. Because ocean fishing is currently not effectively regulated on a global scale, this trend raises red flags for the sustainability of their populations and ultimately of these functions. Livestock production places hefty demands on the environment in the form of land use, nitrogen cycle disruption and greenhouse gas emissions. As demand for protein from animal-based sources grows, so does interest in finding ways to reduce food animals’ environmental impact. One approach under consideration is to supplement traditional feed sources with proteins made by industrially produced microbes. Whether such a practice is a net gain or drain for biodiversity, however, depends on the details. Some proposed systems could reduce land use impacts but increase energy demand, while others could reduce nitrogen and greenhouse gas pollution but lead to more disruption of habitat. Industrial production and use of of microbial proteins for livestock feed would also have as yet unknown implications for people working in the industry. Could the insurance industry play a role in protecting natural areas and helping damaged habitat recover from disasters? That is the idea behind a joint project involving the Mexican government, hotel owners, the insurance industry and The Nature Conservancy. A trust fund known as the Coastal Zone Management Trust has created an insurance policy for a portion of the Mesoamerican Reef in the Caribbean Sea. In the case of a severe storm, the insurance policy will provide funds for restoration projects. In this way, natural assets are able to continue to provide benefits to the people who depend on them. Such a strategy could hold promise for protecting the integrity of other natural systems as well. The Montreal Protocol: Regulation or Guideline? Batteries are ubiquitous yet often ignored, humming in the background while powering appliances, smartphones, and other parts of our lives. They’re also a pivotal piece in the environmental puzzle, as batteries better able to store energy will boost intermittent renewables like wind and solar. These are among the issues raised in Future Brief: Towards the Battery of the Future, a recent report from the European Commission’s Science for Environment Policy service. As researchers continue to experiment with new materials and designs — and as regulators look to shape policy — the report (and its accompanying infographic) outlines several areas for improvement. Infographic courtesy of Science Communication Unit, University of the West of England, Bristol (2018). 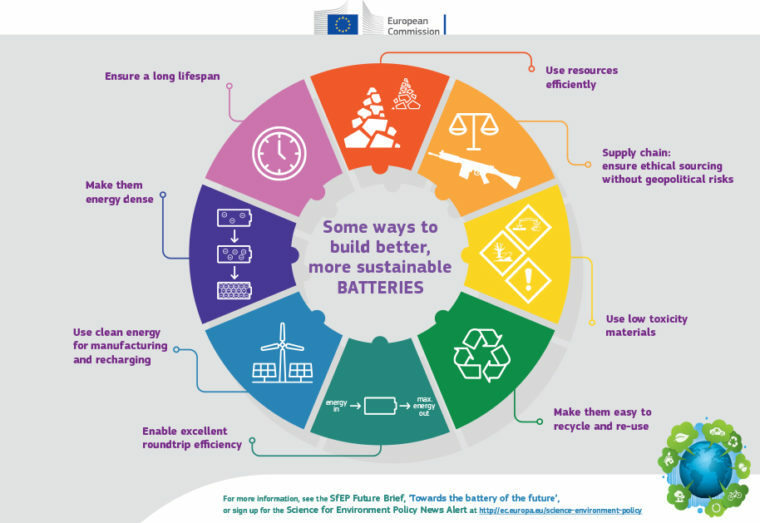 Science for Environment Policy Future Brief: Towards the battery of the future. Report produced for the European Commission DG Environment, September, 2018. Available at: http://ec.europa.eu/science-environment-policy. Click to enlarge. 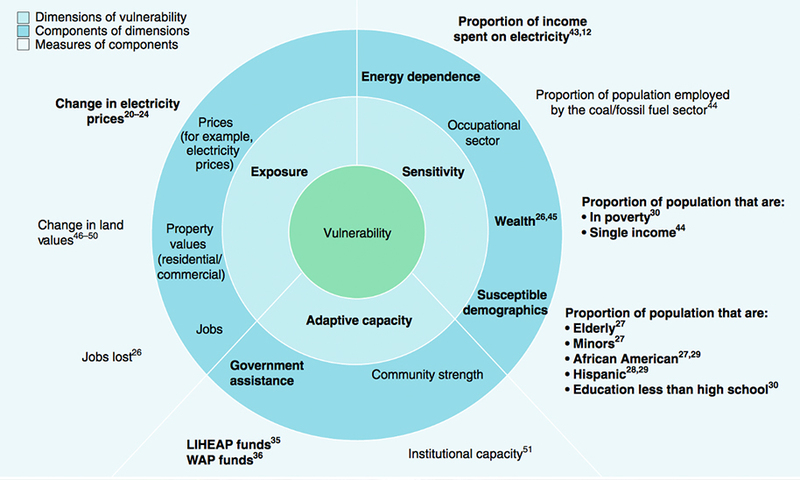 Limiting energy loss, the report argues, can also have big returns. Rechargeable batteries are able to unload most, but not all, of their energy to power phones, cars, and other devices. The remaining portion is lost, with the amount varying: Standard lead-acid batteries waste 20 to 30 percent of their energy over a lifetime, while lithium-ion batteries have energy loss closer to 10 percent. Improving efficiency by even small amounts can cut down on the environmental harms of producing electricity to charge batteries, according to the report. Part of the problem is space: Humans take up a lot of land, with farming alone hogging almost 40 percent of land on Earth. Even if we muster the other resources needed for conserving endangered and threatened species, the question remains: Where do we put plants and animals we want to save? One answer: Devote retired agricultural land to species on the edge. In a review paper published in August in Ecosphere, Chris Lortie, senior fellow with the National Center for Ecological Analysis and Synthesis, and colleagues reported the results of their investigation into exactly that strategy. They zoomed in to California’s San Joaquin Valley, or San Joaquin Desert. Today, agriculture and industry cover some 90 percent of the area, which has one of the continental United States’ highest concentrations of at-risk species. In 2014, the state passed groundwater legislation that could require retirement of hundreds of thousands of acres of farmland in the area, creating stretches of otherwise unused land that could be adopted for conservation purposes. In the new study, the researchers synthesized findings from more than 250 scientific journal articles relevant to using retired farmland for conservation in the San Joaquin desert. “This review suggests that retired agricultural land is a viable asset for threatened and endangered species,” the researchers wrote. But the specifics vary from place to place, and in the San Joaquin Desert, as in other areas, they say that specialists would need to test various restoration techniques and figure out how much such efforts would cost. To gain insight into how agricultural land might be turned toward conservation purposes, the researchers focused on three endangered animals: the San Joaquin kit fox, the giant kangaroo rat and the blunt-nosed leopard lizard, all of which are found only in the San Joaquin Valley. After poring over the journal articles and additional materials from universities and government agencies in California, the researchers summarized some key conclusions. First, they found that large amount of land in the San Joaquin Valley was once suitable habitat for the three species, but habitat loss has left them struggling for places to live. Retired agricultural land, the authors say, could be useful not only as habitat for endangered endemic species, but also as pathways allowing animals to move between existing populations, which might help those populations maintain genetic diversity. The researchers also say that retiring agricultural land near existing animal habitat will boost the chance of successful conservation. But it’s not just a matter of setting land aside for conservation. Restoration efforts would need to cut down on the prominence of exotic plants and find ways, such as mulch and irrigation, to combat the challenges recent droughts pose for reintroduced native species. While the researchers gleaned this information from the hundreds of studies they reviewed on the San Joaquin Desert, they found few projects directly experimenting with restoration on the ground. They also turned up no information on how much it might cost to turn former farmlands into new habitat. Transitions by definition are disruptive. Whether it’s switching jobs, electing new leaders, passing laws or adopting innovative technologies, some people gain while others lose. So it’s no surprise that, just as manure shovel manufacturers found the switch to horseless carriages shaking up their world, the current shift from fossil fuels to low-carbon energy sources, though ultimately beneficial to all of us, will cause pain to some people in the form of lost jobs, destabilized communities and more. The way we power our lives is undergoing a huge transition. How can we minimize the pain and maximize the gain? Whether it’s using plants to power muscles, ancient buried carbon to transport ourselves, or nuclear reactions to light up the dark, humans always have — and always will — depend on energy to meet the basic needs of life. Exactly how we do that, though, is undergoing a change today as profound as the ones that moved us from depending on our own labor to horsepower, or from horsepower to fossil fuels. Underlying changes in geopolitics, environmental and health concerns, economics, technology, consumer demand and business models are driving a global transition toward more sustainable, inclusive, secure and affordable energy production, distribution and consumption systems. How smoothly the transition takes place, and how the benefits and costs of undergoing it balance out, likely will depend on the extent to which we strategically direct it, rather than just let it happen. To that end, the World Economic Forum (WEF) has established a Systemic Initiative on Shaping the Future of Energy as a way to argue for, and provide tools for shaping, a good energy transition. As part of that effort, WEF, with help from McKinsey & Company, just released a new guide aimed at stimulating policies, corporate actions and public-private collaborations that promote a healthy shift. Countries around the world vary dramatically in how well their current energy system works and their readiness to move to more sustainable systems. Courtesy of World Economic Forum. Click to enlarge. The guide, Fostering Effective Energy Transition: A Fact-based Framework to Support Decision-Making, presents an Energy Transition Index (ETI) that makes it possible to quantify for individual countries how well the current energy system is working (measured along the three dimensions of security and access, environmental sustainability, and economic development and growth) and the country’s readiness to undergo a transition to a new energy system, taking into account factors such as infrastructure, institutions, capital and political commitment. Applying the index to 114 countries around the world, WEF draws three main conclusions. First, though most countries assessed have improved their energy systems in recent years, there is still plenty of room for improvement. Second, energy transitions can be encouraged by 1) creating conditions that facilitate desired change; 2) making sure to make improvements across all three areas of access, sustainability and economy; and 3) pursuing strategies that provide multiple synergistic benefits. Third, it’s important to recognize that each country needs to follow its own path — yet each can still learn from others. 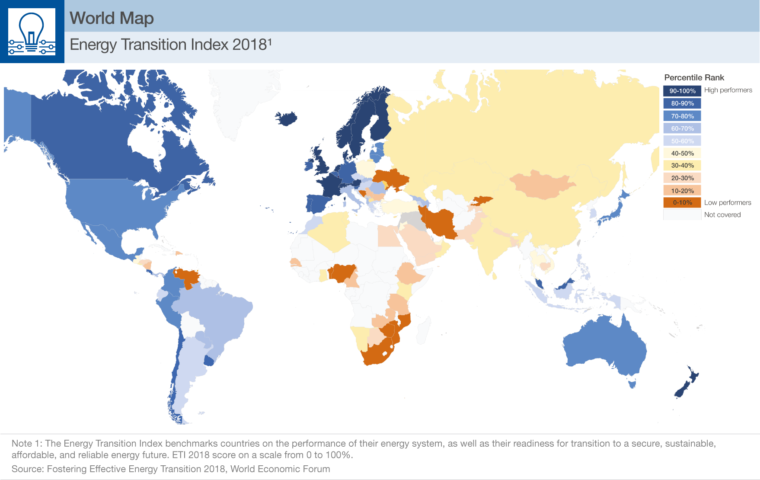 WEF plans to update the index regularly to provide further benchmarks and feedback across time in hopes people will use the ETI to better understand how prepared various countries are to undergo an energy transition, motivate less-prepared countries to prepare, and provide ideas for how to best go about doing so. Tallgrass prairie, and the rich diversity of plants and animals it supports, covered 150 million acres (61 million hectares) of the central United States when white settlers began plowing it under in the 19th century to make room for crops. In today’s agriculture-dominated Midwest and eastern plains, about 4 percent of that prairie remains. Now, a team of Iowa State University researchers, educators and extension agents is turning up evidence that weaving strips of prairie into row-crop farms can provide valuable wildlife habitat while blunting some of the worst environmental impacts of modern agriculture in the midwestern U.S.
Those impacts are significant. Excess nutrients from fertilizers and manure have fueled a New Jersey–size “dead zone” in the Gulf of Mexico, sparked legal fights in Iowa about polluted drinking water and blanketed parts of the Great Lakes in algae. At the same time, corn and soybean fields displace grassland habitat for wildlife and are sloughing off soil at an unsustainable rate. In a paper published last year in the Proceedings of the National Academy of Sciences, the group reported a decade’s worth of data showing that covering just 10 percent of cropland in prairie strips — planted in ribbons about 20 to 30 feet (6 to 9 meters) wide, perpendicular to the land’s slope as a barrier to runoff — cut soil loss from fields where they were planted by 95 percent and reduced phosphorus and nitrogen runoff by 77 and 70 percent, respectively. The strips also more than doubled the abundance of birds and pollinators. The researchers also found that the strips didn’t cost as much as many other conservation practices, and did not reduce yield in the area planted in crops. Nearly 50 farms have planted prairie strips in Iowa, Illinois, Michigan, Missouri and Wisconsin, and a handful more will soon join them. Those growers want to be good stewards of their land, the researchers say, and see prairie strips as an affordable conservation tool that may ultimately help their bottom line by boosting soil health and attracting beneficial insects. Many farmers can offset the cost of strips by enrolling them in farm bill conservation programs and by using GPS and other technology to plant prairie in a field’s least productive areas. As more farmers adopt prairie strips, research into their benefits continues. Some team members, for instance, are investigating strips as a way to halt the spread of antibiotic-resistant microbes. O’Neal and collaborators, meanwhile, are conducting research that suggests nectar- and pollen-rich prairie strips may help honeybees — and, presumably, native pollinators — survive winter by maintaining a healthy weight after crops stop flowering. Though not the main selling point for using prairie strips, the benefit to pollinators is well worth noting, O’Neal says. When your phone stops working or you trade up for a newer model, where does it go? Like any electronic device — from laptops to lamps, washing machines to flat screen TVs — it doesn’t just disappear. It becomes electronic waste, or e-waste — a fast-growing category of trash that in 2016 alone added up to a hefty 44.7 million metric tons (49.3 million tons) worldwide, according to The Global E-waste Monitor – 2017, a new report published by the United Nations University, the International Telecommunication Union and the International Solid Waste Association. That’s the weight equivalent of close to 25 million passenger cars. Even though that e-waste contains billions of dollars’ worth of precious metals and other valuable components, just 20 percent was officially tracked and properly recycled in 2016, according to the new report. The remaining 80 percent? It’s not consistently documented, and most of it is likely dumped, traded or recycled in haphazard, potentially harmful ways. When disposed of incorrectly, for instance by open burning, e-waste can harm people and the environment. The three organizations produced The Global E-waste Monitor – 2017 to draw attention to the threat of e-waste, which they project will climb to 52.2 million metric tons (57.5 million tons) by 2021. 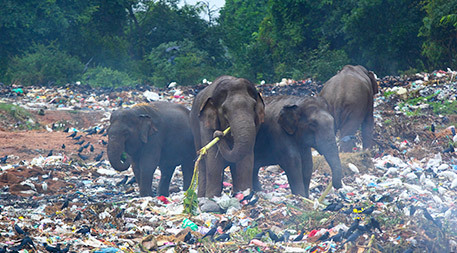 By building awareness of the nature and scope of the problem, they aim to increase global reporting on e-waste as a first step toward minimizing waste production, reducing illegal disposal and boosting recycling and the economic benefits it offers. The report notes that of the more than 190 countries on Earth, only 41 collect international statistics on e-waste, leaving much of the world’s people with little more than anecdotal awareness of where their e-waste ends up. And while experts know that wealthier nations dump lots of e-waste in lower income countries, there are no decent statistics tracking exact numbers. The amount of electronic waste generated (WG) and collected varies dramatically among regions. From: Baldé, C.P., Forti V., Gray, V., Kuehr, R., Stegmann, P. The Global E-waste Monitor – 2017. United Nations University (UNU), International Telecommunication Union (ITU) & International Solid Waste Association (ISWA), Bonn/Geneva/Vienna. Click to enlarge. Because global data aren’t available, the report’s findings are estimates based on a series of statistical procedures. After noting the total weight of all electronic devices sold since 1980, the researchers calculated when products were likely discarded based on their estimated lifespan. By comparing estimates of discarded devices with recorded e-waste statistics, they approximated how much waste is generated and recycled in each of five regions — Asia, Europe, the Americas, Africa and Oceana. In the Global South, hundreds of millions of people are exposed to mycotoxins — deadly compounds produced by fungi growing on food. Each year more than a score of futurists, researchers and others from around the world put their heads together to identify top “under-the-radar” trends that have the potential to dramatically alter for better or worse our ability to protect biological diversity. Planet of the insects? Heck no. Planet of the microbes. Science has long struggled with estimating how many species of living things inhabit our planet. We’ve named some 1.5 million of them, but we know there are vastly more. Highly educated guesses of late have ranged from 2 million to 1 trillion, with most in the range of 11 million or fewer. Now, using DNA analyses that increase the expected number of insect and closely related species to around 40 million, and factoring in the abundant microorganisms that live on or in them, a research team from the University of Arizona has come up with a new estimate: at least 1–6 billion. The study, published in the September Quarterly Review of Biology, differs from previous calculations in three ways. First, it includes all major groups of organisms, not just the ones we can see. Second, it uses molecular analyses to distinguish between species that look alike. And third, it focuses on organisms that live in and on insects, itself an amazingly diverse group. The results, though still quite speculative, dramatically alter our understanding of how life is sliced and diced among different forms. Where insects were once considered by far the most abundant, in the new depiction of what the authors call “The Pie of Life” they are relegated to just part of the tiny wedge allotted to animals, while bacteria and other microorganisms make up the vast bulk — 70 to 90 percent — of the picture. Improved awareness of species diversity provides a valuable foundation for efforts to understand and maintain the integrity of natural systems. The authors note, for instance, that in addition to dramatically expanding and refining our best estimate of the number of species on Earth, the analysis suggests that organisms that live with or in other organisms are the source of most of life’s diversity. Climate change is coming home, and some have no choice but to get out of the way. Last year in Alaska, with its coast thawing and eroding away, the town of Shishmaref voted to relocate. The village of Newtok, Alaska is seeking federal disaster relief to fund its move. In the Louisiana bayou, the native Isle de Jean Charles tribe has lost 98 percent of their land to the sea. It, too, is looking to move. Moving entire communities is no simple task, so successful relocations will need to draw on a range of legal and policy tools. That’s the message from a report co-authored by Burkett and published by the Center for Progressive Reform, a Washington, D.C.–based nonprofit group with a nationwide network of member scholars. The report, Reaching Higher Ground: Avenues to Secure and Manage New Land for Communities Displaced by Climate Change, reviews strategies communities can use to acquire and govern new land while preserving the heritage of the places they’re forced to leave behind. One big challenge is securing new land for relocation. If communities can find ways to raise revenue, for example by taxing local businesses, they can buy land outright. Or communities might seek out government grants and loans. Some funding is available through federal agencies such as the U.S. Department of Agriculture, the U.S. Department of Housing and Urban Development and the Bureau of Indian Affairs. Last year, the Isle de Jean Charles tribe won a US$48 million federal grant, the first of its kind, to help with relocating inland. Communities can also head to Congress. In 2010, for example, Congress allocated over 400 acres (160 hectares) of upland area to the Hoh Indian Tribe, a small coastal community in Washington state threatened by eroding land and rising seas. “Native communities are the first and worst hit when it comes to this relocation issue,” says Burkett. Tribes can investigate whether they have historical claim to areas suitable for relocation. Such investigations may provide grounds for litigation aimed at repossessing these lands. Communities may also consider entering tribal lands into a federal trust. After securing land, communities must rebuild. In the wake of resettlement, how can communities manage infrastructure and land for the benefit of all? One path the report outlines is to incorporate as a city or town, which gives communities power over zoning and taxes, as well as enhanced eligibility for government grants. Another option is to form nonprofit community organizations like homeowners associations and community land trusts. Through such groups, people can manage common property and even buy new land. Whatever kind of legal entity guides resettlement, groups can use legal tools to ensure an orderly transition. The report notes, for instance, that “[c]ommunities can influence land use, development, and ownership by placing legal conditions in property deeds” such as prohibitions on pollution or a ban on forest clear-cutting. Communities might also use property deeds to maintain future integrity. They might, for instance, write deeds giving landowners lifetime ownership of a given parcel with control returning to the community after the owner dies. A deed could also give the community the right of first refusal for purchasing land back before it is sold to another entity. The report underscores the importance of equity and self-determination for relocating communities. Beyond concerns about what will happen to an area’s natural resources, the report notes, people’s identities are intertwined with the places in which they live and which are part of their history. The report notes that rights to resources such as minerals and timber can be separated from rights to own the land’s surface, opening a door for communities to sell land without losing access to economically important raw materials. To help communities retain selected land rights the report recommends easements, which can guarantee ongoing access to land or the preservation of natural features and historic structures. For tribes, historical treaties may include provisions allowing members to use traditional lands for subsistence, provisions that can provide a legal basis for continued access to lands left behind. Communities can also work to have such rights legislated. Near the Bering Sea, for example, residents of the native village of Newtok, faced with relocation, were able to secure legislation retaining their right to fish, hunt and gather on traditional lands. Climate relocation is complex. While options abound, many are limited in scope and potential, requiring intensive coordination and creative problem solving. And, with disaster constantly looming on the horizon, pressure is on to prepare sooner rather than later. From migrating birds to pollinating bees to seed-dispersing plants, thousands of species depend on the quality of the aerosphere­ — the layer of air that surrounds our planet. Despite this, aircraft, wind farms, drones, telecommunication towers and other anthropogenic infrastructure increasingly crowd this critical habitat. Current species conservation efforts are generally focused on terrestrial and aquatic habitats, but not on airspace as a similarly important ecosystem. This needs to change, says a group of Canadian scientists in a recent article in Conservation Letters. The authors want to see the airspace recognized and protected as an ecosystem that supports myriad species in a diversity of ways. It’s well known that many birds are killed in collisions with manmade structures — an estimated 44 million-plus per year in Canada alone. Efforts are underway to tackle this issue, but the authors argue for a more comprehensive framework that incorporates other threats such as aerial habitat fragmentation and chemical pollution, as well as for legislation that assigns responsibility for aerosphere conservation. Aerial habitats may be as important as wildlife corridors and marine parks for preserving biodiversity. The authors’ analysis of threatened vertebrate species suggests that roughly 20 percent rely to some extent on air space. The proportion may be much higher for the thousands of insects, plant seeds and microorganisms that drift or zoom through the air, they say, but right now, we don’t know what those numbers are. Research that investigates these gaps makes up only a small proportion of published studies in this field. For example, Davy says, with the right policy, an aerial protected area could be established to minimize harm to a host of migrating species like birds or insects. “It wouldn’t even need to be in place year-round to be an effective tool,” she notes. Florida’s Kissimmee River once flowed freely. Fish, birds and other wildlife dwelled in the wetlands it fed. But in the 1960s, spurred by public outrage over flooding, the U.S. Army Corps of Engineers straightened the winding waterway and turned it into a drainage canal. Nitrous oxide is a potent greenhouse gas and ozone-layer depleting compound, and each year humans are responsible for releasing millions of tons of it into the air. Recently, an international group of chemical engineers suggested an innovative strategy for reducing nitrous oxide levels globally: Partner an electricity-producing system known as a solar chimney power plant (SCPP) with reactive glass that can decompose nitrous oxide from the atmosphere into nitrogen and oxygen. Courtesy de Richter, R., Ming, T., et al. “Removal of non-CO2 greenhouse gases by large-scale atmospheric solar photocatalysis.” Progress in Energy and Combustion Science 60 (2017): 68-96. An SCPP is composed of a low canopy at the base for collecting air and absorbing sunlight, a tall hollow tower to control the release of clean air, and turbines that generate electricity. 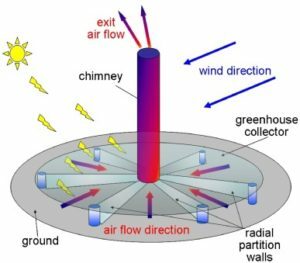 The researchers propose layering the solar chimney’s canopy area with glass plates coated with titanium dioxide, a product found in things like paint, sunscreen and food coloring that can use light to break down nitrous oxide. Because titanium dioxide is self-cleaning, non-toxic, cheap and stable, the report suggests, the result would be a sustainable and low-maintenance option for reducing nitrous oxide pollution while also producing power. Climate change’s effects on humankind may prove most severe on the African continent, due to widespread poverty and unstable governance in many countries. Yet scientists and policy-makers on the continent suffer from a serious lack of access to climate science data. Future Climate for Africa aims to change the tide by conveying the latest scientific information to those who need it most as well as identifying knowledge gaps and filling them. In that vein, FCFA just published a new report that provides easy-to-digest fact sheets on climate trends and implications in various regions throughout the continent. “Africa’s Climate: Helping Decision‑Makers Make Sense of Climate Information” compiles the latest science into 15 fact sheets. The first five fact sheets provide general climate information for central, east, southern and west Africa, with one additional fact sheet on southern Africa aimed at scientists. The next four fact sheets address “burning questions” related to climate science in the four regions. The report concludes with general reader-level fact sheets on six of the countries in which FCFA works: Malawi, Rwanda, Senegal, Tanzania, Uganda and Zambia. Central Africa: Due to lack of climate data, the central region is severely understudied. Few weather stations exist through the Congo Basin, for example. With the second largest carbon stock of any country, the Democratic Republic of Congo is critical to offsetting greenhouse gas emissions and mitigating climate change. Yet it’s difficult given the current state of the science to predict how climate will affect rainfall or how changes in rainfall will affect carbon stores in the country’s rainforests. Many people in Central Africa rely on rain-fed agriculture, so understanding rainfall changes will be critical to preventing harmful impacts on health and livelihoods. East Africa: Models show that East Africa will become hotter, with less predictable yet more intense rainfall, along with longer dry seasons in the coming decades. On the other hand, models sometimes provide conflicting and uncertain results, particularly with rainfall. Tropical Africa has two rainy seasons, “short rains” and “long rains,” interspersed with dry seasons. East Africa has experienced droughts during recent long rains seasons, yet models predict increasing rainfall in the decades ahead. Adaptation projects in this region will require flexibility so nations can respond to whatever changes actually occur. Floods are likely to affect sanitation in urban areas. Uganda relies on hydroelectric power and exports energy to Kenya, and will have to adapt to increased or decreased rainfall and address water release rules to hold more in high rainfall years. Southern Africa: The subtropical area of southern Africa experiences four seasons and has a series of mountain ranges that influence weather. Oceans on either side of the region influence rainfall. Southern Africa is relatively well studied, with over 40 climate models simulating the next 5 to 50 years and some simulating up to 100 years. This fact sheet includes a primer on how climate simulations work and how they model uncertainty. West Africa: People’s daily lives in the West Africa region are substantially affected by year-to-year climate variability, due to reliance on rain-fed agriculture and limited availability of clean water, among other things. The region has already experienced an average temperature rise of 1 °C (1.8 °F) since 1950, and in the Sahel average temperature has increased even more, mostly due to hotter nights. Climate models show increased temperatures, although predicted changes in rainfall vary among models. Cities are hubs of commerce, politics, population — and evolution? Yep. Due to human-wrought environmental change, biological evolution moves more quickly in cities than in other areas, according to a new paper published by an international team of researchers in Proceedings of the National Academy of Sciences. The study, based on analysis of 89 previously published studies, found that for animals and plants, models based on whether urbanization was in play best explained speedy evolution of observable traits such as body size, anatomy, life cycle, behavior and physiology. Alberti gives the example of electrical transmission towers. One study from the United Kingdom found that in soils polluted with zinc due to the towers’ presence, different grasses, such as sheep’s fescue and tufted hairgrass, have evolved different levels of zinc tolerance. However, genes needed for tolerance don’t appear in every individual of a species; if tolerant plants are absent in some local habitats, this could affect the ecosystem by changing the local community composition. Urban environments are the backdrop for many such interactions, which can happen at a speed that hasn’t always been associated with evolution. To take a stab at determining which aspects of urban development hasten evolution’s pace, the researchers coded different kinds of urban disturbance into their models. They found that introduction of new species — predators, prey, hosts and competitors — had a large association with the changes they looked at. Another potentially major driver of rapid urban evolution is the number and speed of interactions between people and people, people and animals, and people and plants. Counterintuitively, changes to habitat correlated with relatively low evolutionary change, a finding the researchers said might be due to limitations to the study’s methods. A few words of caution, though: This research is the first to systematically and explicitly examine, using a large global data set, how urbanization affects evolution, so other researchers have not yet replicated it, a process that could help confirm the findings. Meta-analyses like this study rely on already published research, and it’s impossible to get a truly random sample of phenotypic (observable) changes from across the globe, so over- or under-representation of studies from particular areas, ecosystems, or organisms could affect the results. In particular, the authors acknowledge that their conclusions about the relative importance of different urban processes to evolution should be viewed with caution because those results might be influenced by factors including both which species the academic literature considers and the way in which the authors classified interrelated variables that affect evolutionary change. 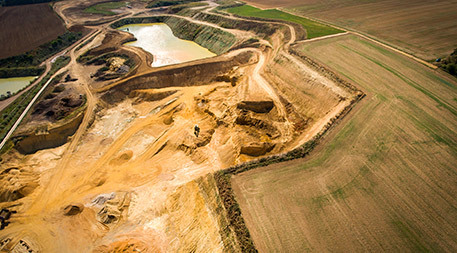 Manmade chemicals may alter ecological processes, yet few scientists are studying the role of these chemicals in global environmental change, say a group of researchers from the U.S. and Germany in a scientific paper published today in the journal Frontiers in Ecology and the Environment. For public land managers, policy-makers, natural resource specialists, farmers, ranchers and others in the business of protecting and renewing the world’s diverse ecosystems, it’s easy to get lost in a sea of studies and strategies. How does a person determine which solutions will yield the best results in any given situation? Want to solve big problems? Start small. Seeds of Good Anthropocenes, a website created by an international team of sustainability scientists, seeks to do just that. The site showcases more than 500 initiatives from around the world that, while not widespread or well known, might contribute to a sustainable future. The purpose of the project, according to its founders, is to provide a middle ground between gloom-and-doom reports, which may inadvertently spur feelings of powerlessness and resignation, and those that are overly optimistic and risk inciting complacency. Writing in Frontiers in Ecology and the Environment, the founders argue that we should break through this dichotomy by looking to “seeds” — environmentally beneficial tools and techniques that are neither untested proposals nor established practices. Each seed offers an idea that helps in some way to address challenges posed by the Anthropocene, such as environmental awareness, urban sustainability and equitable decision-making. “Seeds are initiatives (social, technological, economic, or social–ecological ways of thinking or doing) that exist, at least in prototype form, and that represent a diversity of worldviews, values, and regions, but are not currently dominant or prominent in the world,” the team wrote. The founders hope these seeds help identify values and approaches that people organically gravitate toward when facing the Anthropocene. Seeds can inspire similar projects in new areas. The traditional satoyama landscape varies land use and preserves biodiversity to balance agricultural needs with ecosystem stability. The Satoyama Initiative hopes to revitalize this agricultural approach in part by connecting with city dwellers to solicit financial donations and volunteered time. Good news: more people across the globe have improved access to safe water and sanitation. Bad news: air quality is a growing problem in lower-income countries. The Population Reference Bureau’s 2016 World Population Data Sheet, released in August, offers valuable insights into not only current and projected demographic measures, but also health, energy and environment trends around the world. Self-driving taxis, parking lots replaced by parks, quiet freeways, clean air, Wi-Fi-enabled traffic control, light rail trains zipping from one end of town to another — sounds like the stuff of science fiction. But experts at McKinsey & Company and Bloomberg New Energy Finance argue that these technologies aren’t so far-fetched in some urban areas, given today’s market trends. Their new report, An Integrated Perspective on the Future of Mobility, paints a picture of what transportation could look like in leading-edge cities 15, 20, 30 years from now that should be of great interest to urban planners, public officials and professionals in the digital technology, communication, environmental and automotive industries — along with the estimated 500 million people who will be directly affected.